Whether your players are struggling to maintain their sanity in a mind-warping vault filled with elder evils or simply looking for a good place to curl up and drool, Pathfinder Flip-Mat: Mythos Dungeon has you covered. Each side of the Flip-Mat features the ruins of a madness-inspired dungeon home to alien entities best left undisturbed. Don't waste your time sketching when you could be playing. 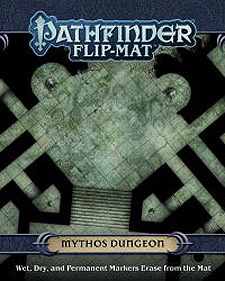 With Pathfinder Flip-Mat: Mythos Dungeon, you'll be prepared next time your players want to risk their minds and souls as they venture out in search of the unknown! Get to the game faster with Pathfinder Flip-Mat: Mythos Dungeon, and be ready whenever your players stumble across horrors from beyond space and time!